he size of the head magnet may not be easy for a friend who is new to the magnet, so what is a head magnet? What are the advantages of a large and small head magnet? The price of the head and the magnet will not be much more expensive. Let's take a look at the size of the head magnet. What is a head magnet? NdFeB neodymium size head strong magnet can be understood as two round magnets of different diameters stick together, represented by large diameter D1* thickness + small diameter D2* thickness. 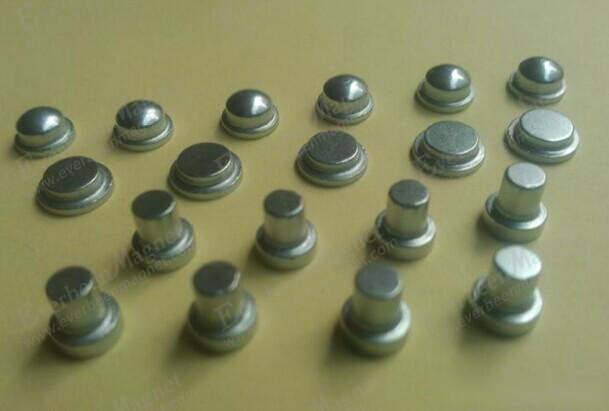 For example, a magnet of D5*1.8+d4*1.9mm means a large head diameter of 5 mm, a thickness of 1.8 mm, a small head magnet diameter of 4 mm, and a thickness of 1.9 mm. What is the role of the head magnet? Like some slotted magnets, it is mainly used for card positions or special requirements. Shape: Large and small head magnets, diameter and thickness can be manufactured according to your requirements. Material: N35-N52, high temperature resistant material. Plating: galvanized / nickel plated / nickel plated copper nickel / epoxy coated. How much is the price of a big head magnet?